A cluster of utility lines fill the sky in York Village. The York Village revitalization project is ramping up, with the goal of a spring 2020 start date. 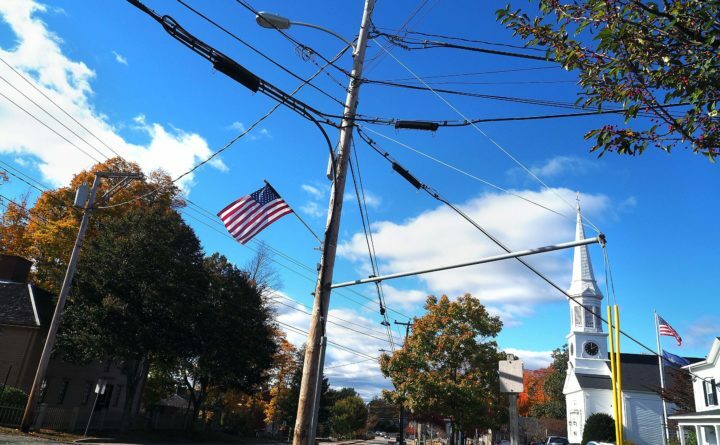 And as advanced planning begins in earnest, town officials want to know if it’s possible to get rid of the overhead power lines and bury utilities underground in the heart of the village. But what is the cost of such a move? Town officials have agreed to use $50,000 in design funding to find out. Selectmen and Village Revitalization Committee members say if it’s feasible it would reduce visual pollution and enhance the appearance of the village. Public Works Director Dean Lessard said the perfect time to bury utilities is while the roads in the village are dug up anyway for the planned redesign. The federal government is paying for 80 percent of the $4 million costs of the revitalization project, and so “a rigorous federal and state project development process” is taking place now and decisions need to be made, he said. Money is the key issue, perhaps not surprisingly. The cost of burying utilities will have to be borne by local taxpayers, as such a project does not qualify for traditional federal or state funding. The design team hired by the town conducted a preliminary analysis of the cost in 2017, to include an area bounded by the main entrance to the cemetery to Fellows Lane on York Street; and from the start of Long Sands Road to just past Coventry Hall. The estimate was $3.6 million — which Selectman Dawn Sevigny Watson said “in this climate is going to be a hard sell” to voters. “I would aesthetically like the town to look this way, but fiscally, that’s a big nut,” she said. As a result, the revitalization committee narrowed the scope of the area. The $50,000 study will determine hard costs of removing the poles along the village green and in the heart of York Village and burying lines in just that area. Lessard said he believes the costs will be somewhere in the vicinity of $2 million. The project itself is actually being undertaken in two phases. Phase 1 will include reconstruction of the York Street and Long Sands Road intersection, including the removal of the traffic island. Long Sands Road will become a T intersection with York Street. Work on York Street will be undertaken in Phase 2, which will not begin until well into the 2020s. As such, there is a possibility to go back to voters to bury more lines in the future, said Lessard. Revitalization Committee Chair Chris Hartwell asks the public’s patience with the late start date. Some $400,000 in taxpayer funds for the project were approved in 2016 — representing a 10 percent local match required for federal funds. But the federal money is coming in in dribs and drabs, and is competing with other regional projects that are also vying for the same funding. The feds have committed to the project, but it’s going to take until October, 2019 for there to be enough money to fund Phase 1.